TOP FURTIVE: Control Your Android Through PC Without Data Cable via. 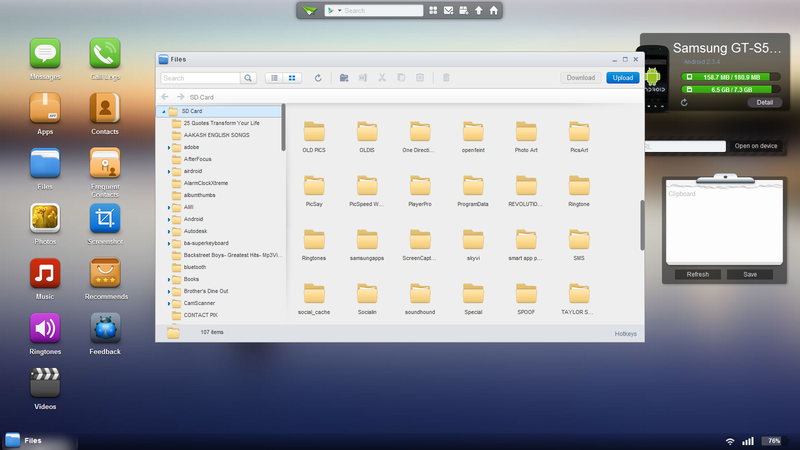 AIRDROID. Control Your Android Through PC Without Data Cable via. AIRDROID. AirDroid is a fast, free app that allows the user to manage Android without any wire connection from your favourite browser. AirDroid for Android replaces USB cable with your Web Browser and allows the user to transfer files back and forth, send text messages, play music, view gallery and manage applications- all without installing anything on your computer. AirDroid is completely free. It functions as the web server, allowing the Android device and computer to communicate over the network. AirDroid is compatible with most devices running Android 2.1 and later. The web Desktop should be compatible with most modern web browsers like Chrome 12 and later, Firefox 3.6 and later, Safari 5.0 and later. (For best performance IE is not recommended). NOTE:- ANDROID PHONE AND COMPUTER MUST BE CONNECTED TO "SAME WIFI NETWORK". 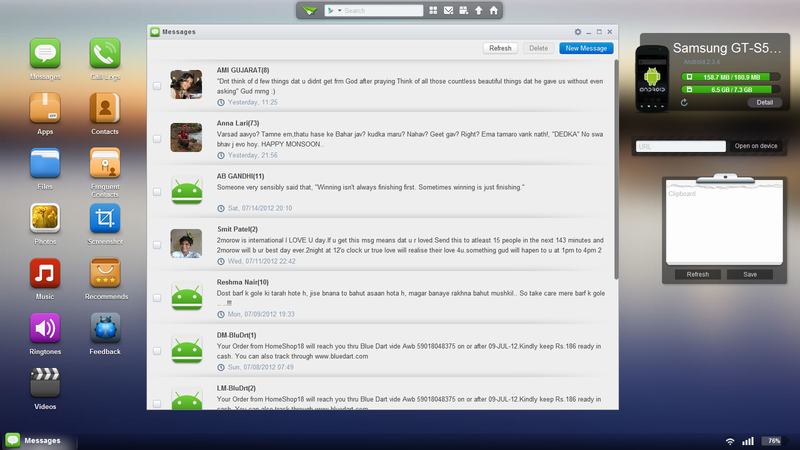 AirDroid is available from GOOGLE PLAY without any cost. It supports Android 2.1 and later. 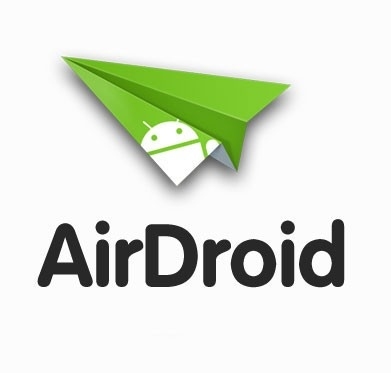 CLICK HERE to download AIRDROID from Google Play Store. 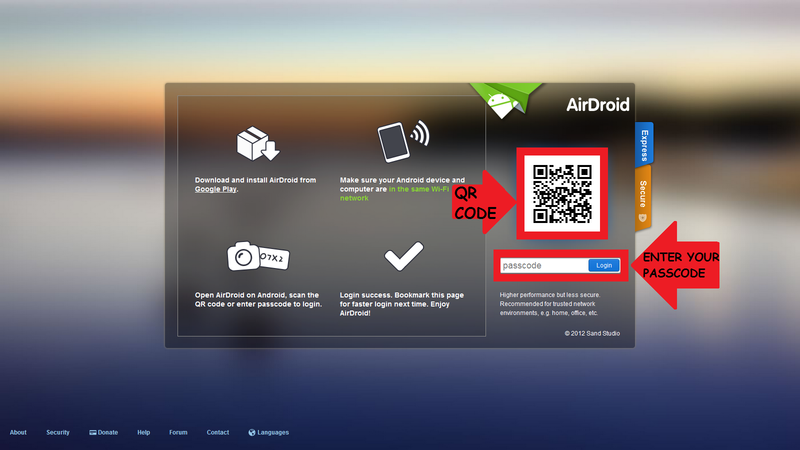 Launch the AirDroid app once it has installed and click on Start to start the AirDroid server. 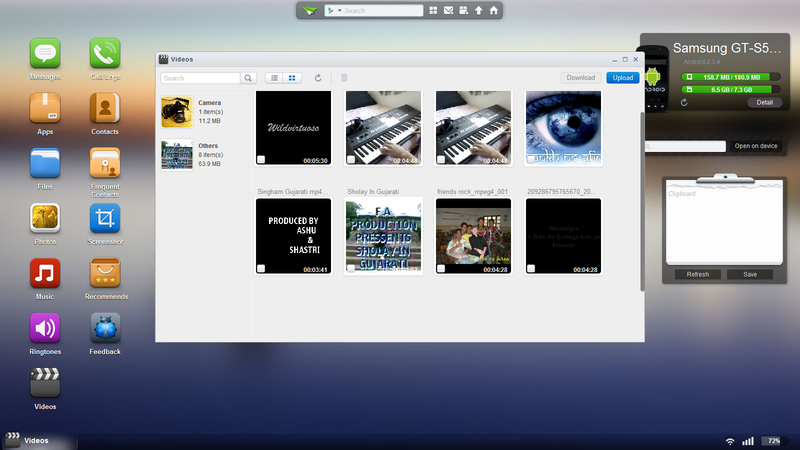 Visit the site web.airdroid.com or enter the IP address shown on your mobile screen into your browser on PC. Here are two ways you can use. Click on the camera button on step 2 of your mobile, your phone camera will be launched and now scan the QR code shown on the website. And the connection is established. On website’s homepage you will have to enter the passcode displaying on your Android phone and you are done. If you are connected the message "Success. Connecting..." will be displayed. Thats it now you are done. Transfer files between Android devices and computers. Now with drag & drop support. Cut, copy, paste, search, rename or delete files on the SD card. Receive, send, forward or delete SMS messages. Install, uninstall, backup, search apps and do batch processing. 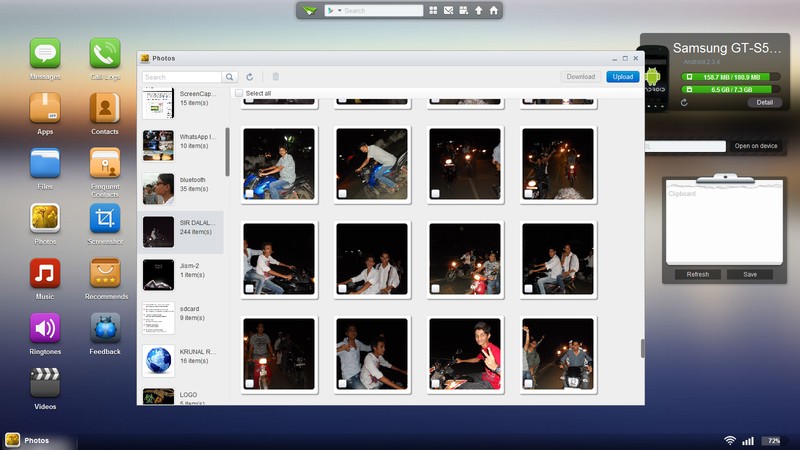 Preview, delete, upload, download, set as wallpaper and photos slide show from desktop. Share clipboard text between desktop and device. Group, search, create contacts, check and delete call logs. Search, preview, upload, download, delete and customize ringtones for phone calls, notifications and alarms. Play, search, upload, download, delete, or set as phone call, notification and alarm ringtones. View your Android's screen, take a screenshot, or even record a screencast. 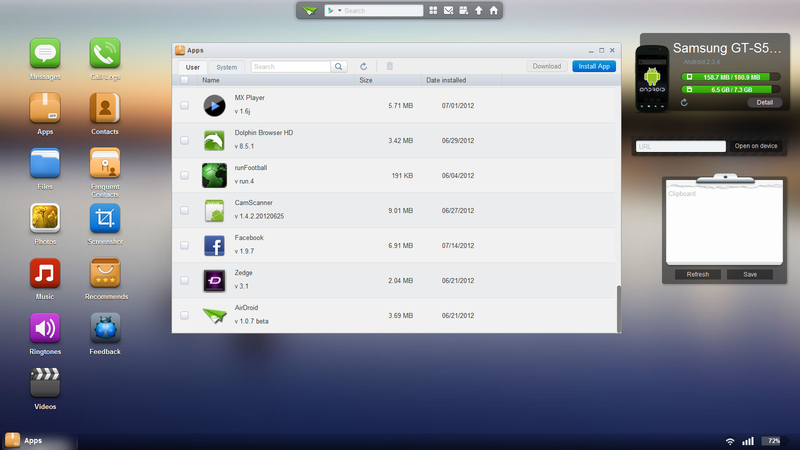 AirDroid is designed for multitasking. 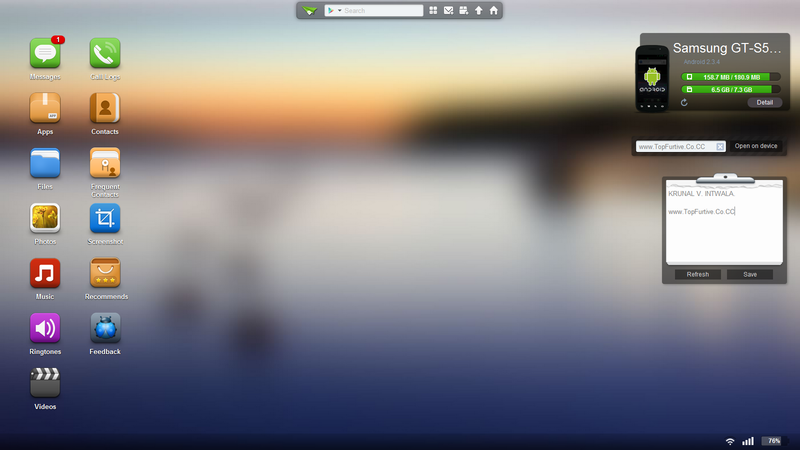 Move apps between desktops to better organize your work. Mobile devices are great for videos shooting, but big screen computer may be better for viewing these clips, isn't it? Real-time ROM, SD Card, Battery, CPU and RAM status report & monitor with charts to demonstrate available/used/total resources, and one-tap memory boost. Kill or uninstall running apps, batch operation supported. Uninstall, share or check details of user and system apps. Control Cut, copy, rename, send/share, delete, sort and create visible or hidden folders and files. PLEASE DO SHARE AND COMMENT IF YOU LIKE THIS POST. Artikel Control Your Android Through PC Without Data Cable via. AIRDROID. ini dipublish oleh Unknown pada hari . Semoga artikel ini dapat bermanfaat.Terimakasih atas kunjungan Anda silahkan tinggalkan komentar.sudah ada 0 komentar: di postingan Control Your Android Through PC Without Data Cable via. AIRDROID.